Local 455’s Maria Pinzon and Christopher Kristenson repair a Frogtown homeowner’s furnace. Over 100 low-income, elderly and disabled homeowners in Minnesota received free furnace repairs and inspections Saturday, thanks to union pipefitters and their contractors. Project Heat’s On, in it’s 31st year, drew volunteers from local unions in St. Paul, Minneapolis, Rochester and St. Cloud. In the Twin Cities, 90 members of St. Paul Pipefitters Local 455 joined the effort, as did 80 members of Minneapolis-based Local 539. 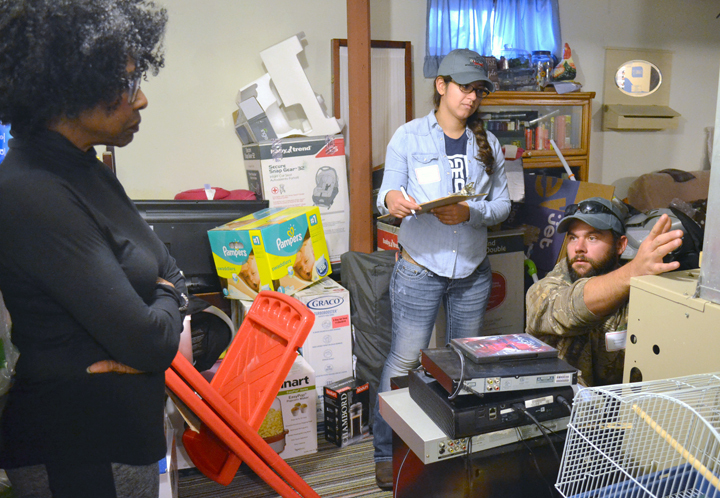 Pipefitters like Maria Pinzon and Christopher Kristenson, fifth-year apprentices with Local 455, traveled in teams to homes, where they repaired minor furnace problems, replaced smoke detectors and checked for dangerous heat-related health conditions. At a breakfast banquet before the volunteer event, union leaders and elected officials, including Minnesota Gov. Mark Dayton and Sen. Amy Klobuchar, thanked pipefitters for their work – and for raising awareness about the importance of keeping home-heating systems in good repair. Among the causes of home fires in Minnesota, heating systems recently dropped from second-most common to third, A.J. Neis, a fire inspections supervisor with the City of St. Paul, told volunteers. “The needle is moving in the right direction, and that’s because of the work you guys are doing,” he said. Since its launch in 1986, Heat’s On volunteers have donated more than 34,000 hours of skilled labor, providing more than $3.7 million worth of repairs to 7,869 Minnesota households. For Pinzon and Kristenson, the first stop of the day was a home in St. Paul’s Frogtown neighborhood. After tuning up the furnace and replacing a condensate drain line, they headed for another home in the city’s North End. Pipefitters from Locals 455 and 539 gather for a photo after the Heat’s On breakfast banquet.